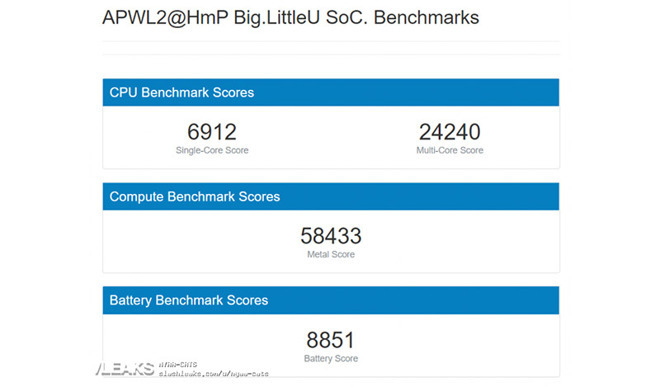 Information provided by an anonymous uploader claims the 10-core version is clocked at 3.4GHz, while supposed Geekbench screenshots show the 12-core chip, referenced as “APWL2@HmP,” running at 3.19GHz. The two application processors achieved respective single-core scores of 7335 and 6912, and multi-core scores of 20580 and 24240. What device the alleged ARM chips are powering is unknown, but the performance of each falls in line with desktop class hardware. Both processors beat single-core benchmarks set by Apple’s 2017 27-inch Retina 5K iMac with 4.2GHz Intel Core i7-7700K, while the purported 12-core ARM chip’s mutli-core score bests the 2018 15-inch MacBook Pro with 2.9GHz Intel Core i9-8950HK. It is unclear if the benchmarks shared today are legitimate, but it should be noted that the uploader joined Slashleakson Friday and has no past record with the website. Further, the “APWL2” device designation, assumedly a reference to the chip’s product code, does not align with Apple’s naming scheme for recent A-series processors. The A12 Bionic found in current iPhones, for example, bears the APL1W81 mark, while its A11 Bionic predecessor was labeled APL1W72. AppleInsider was unable to verify the leak and does not vouch for its veracity.